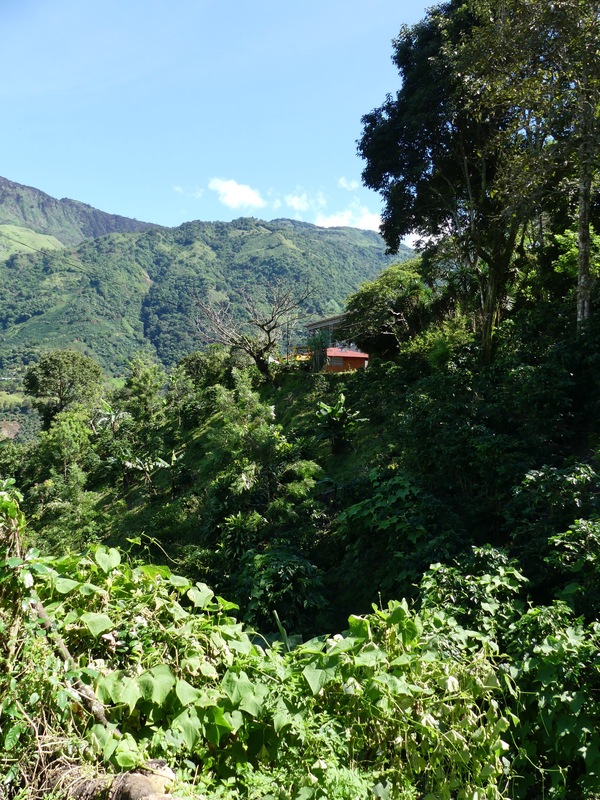 We’ve travelled through steep mountain passes from San José into Costa Rica’s prime coffee zone, Tarrrazú, where the hillsides glisten a deep olive green with coffee bushes, flecked with shade trees and fruits such as avocado, mango, plantain and banana palms. Climbing up to the hillside community of Llano Bonito, we pass the primary school that Gerardo was pulled out of as a child after just four years before he could get his basic school certificate. He puts the truck into four wheel drive to bump down a hairy hairpin muddy track. The local municipal diggers had started work to improve it with more gravel, but pulled their machinery out after a landslide, so local farmers have been left trying to make it safe themselves. There were no four wheel drive vehicles when Gerardo was growing up, just horses to bring the farm’s coffee up the hill to the nearest collection point. His father was caught in a Catch22, quite literally between a rock and a hard place, not growing enough coffee to keep all the children in school or buy a truck of their own, but not wanting to plant more coffee either because he wasn’t sure he could transport up the hill. There was always plenty of food on the farm, says Gerardo, but no electricity, no new clothes, no money. In his father’s and earlier generations, some members of the family didn’t even have houses, but lived in the shelter of enormous rocks. 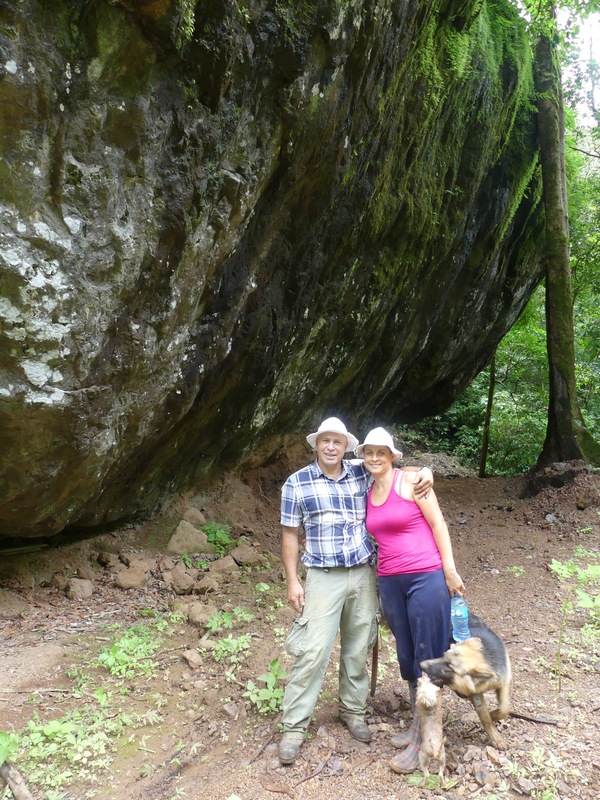 The four rock houses are what gives Gerardo’s farm its name: Casa de Piedra. It was the arrival of a new schoolteacher that helped turn things around, setting up adult evening classes which allowed teenage Gerardo to go back to school. It was a two hour walk each way, after working on the farm from dawn each day, often returning home along the mountainside in the dark, but he persevered and finally got his school certificate. This allowed him to then get a technical tailoring qualification and paid work, which he then juggled with working on the farm. But by the age of 18, Gerardo had had enough. With the money he saved and a further loan from another family member, he paid a coyote to help him illegally migrate to the US. You can read more about the perilous journey he took here. 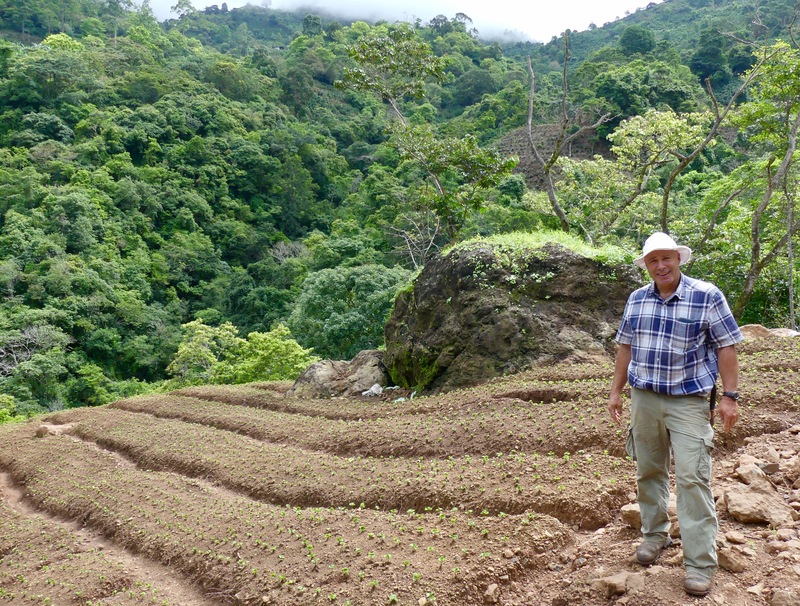 With the money he earned over ten years in the US, Gerardo was eventually able to return to Costa Rica and buy his father’s farm. He joined the local cooperative, which was just securing Fairtrade certification, and rose to become a Director and eventually its President. The new house and micro-mill. Check out the cool tree branch pillars! The view down to the Pacific Ocean from the farm! This would be an awesome ecotourism spot! We finally arrive at the farmhouse, now totally transformed from the place where he grew up. The house itself was completely rebuilt seven years ago after the old home was literally blown down in a storm, leaving only the foundations. The remoteness of the farm mean that it was only two years ago that Gerardo and two neighbouring farms were able to pay the local energy company to bring electricity here. Just two years ago! 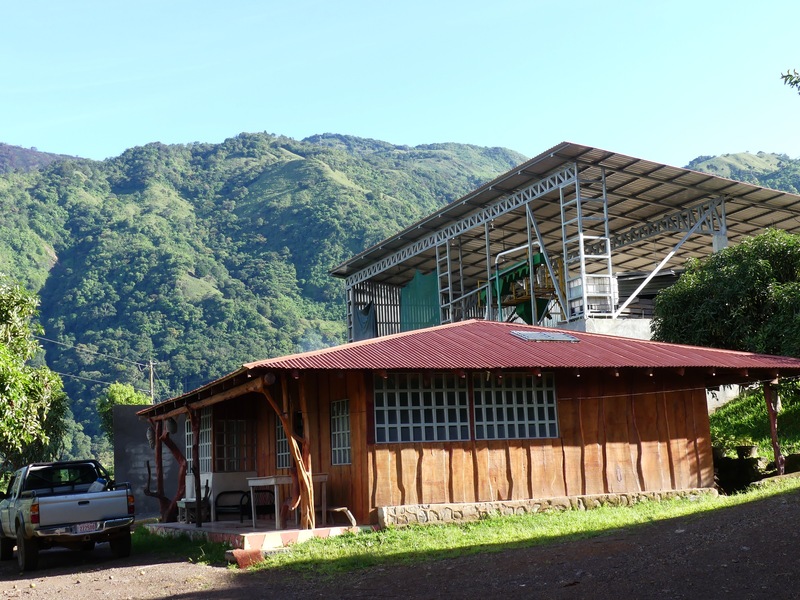 Now electricity is also running the micro-mill Gerardo installed four years ago. In a new warehouse structure towering above the homestead, from which there’s an amazing view across the verdant mountains to the milky blue ocean in the distance, the smell of fresh green paint wafts amongst smartly maintained depulping, washing and grading machines. Before electricity arrived two years ago, Gerardo had improvised power with a cog attached to the wheel axel of his truck. Below the mill, signs of more construction herald the next stage of development, the installation of drying equipment so that the farm is no longer dependent on solar drying alone, especially in wet weather. Gerardo is already stockpiling ’pergamino’, the dried parchment surrounding the coffee beans, from this year’s processing, to use as future fuel for the ovens. 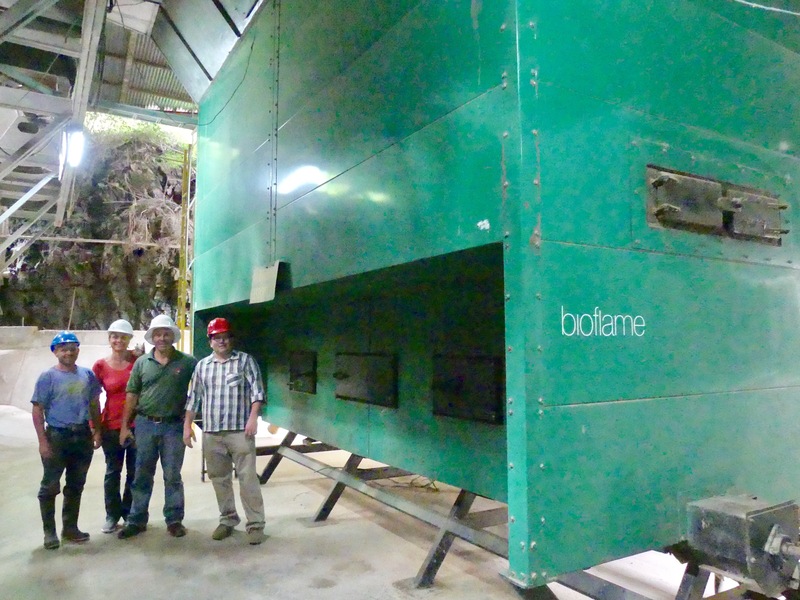 This is also used by the cooperative, who reduced their burning of wood (and therefore local deforestation) by 95% after installing a pioneering BioFlame oven more than ten years ago, the first producer group,in the area to adopt this new technology. Now it is now widely used, and the price of pergamino that fuels the ovens has also risen as a result! 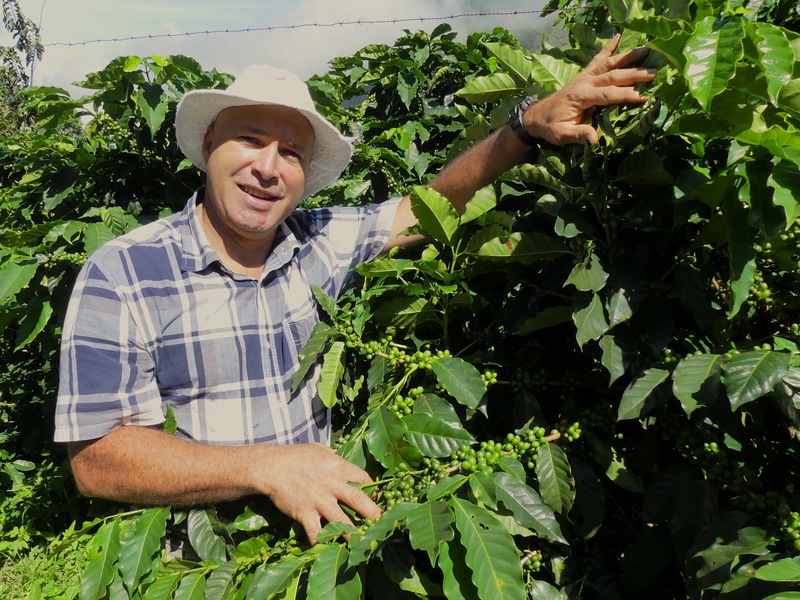 With more stable income through the cooperative’s Fairtrade sales to companies like Cafedirect in the UK and Sustainable Harvest in the US, even in the tough years, smart farmers like Gerardo managed to stay afloat, and even save and invest. 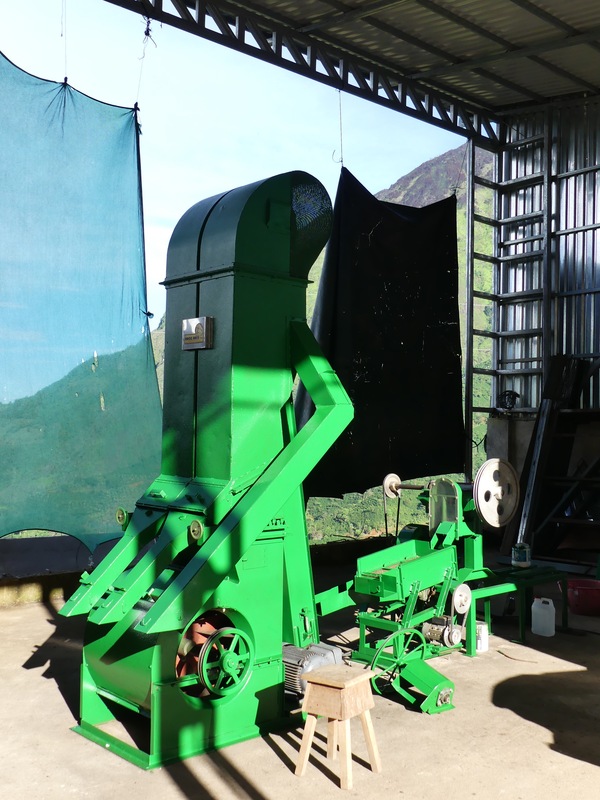 Over the years, he has bought more land, increased production, tried new varieties of coffee to increase quality and resistance to fungal diseases like la roya (coffee rust) and ‘ojo de gallo’ which have destroyed so many other farmers’ crops. Last year Gerardo produced around 800 quintals (1 quintal = 100lbs) of coffee, but as production has increased, rather than selling it all to the cooperative, having the micromill means he is now able to tap into the growing trend for single origin, speciality coffee, including natural and honey coffees, which are sold through microlots. 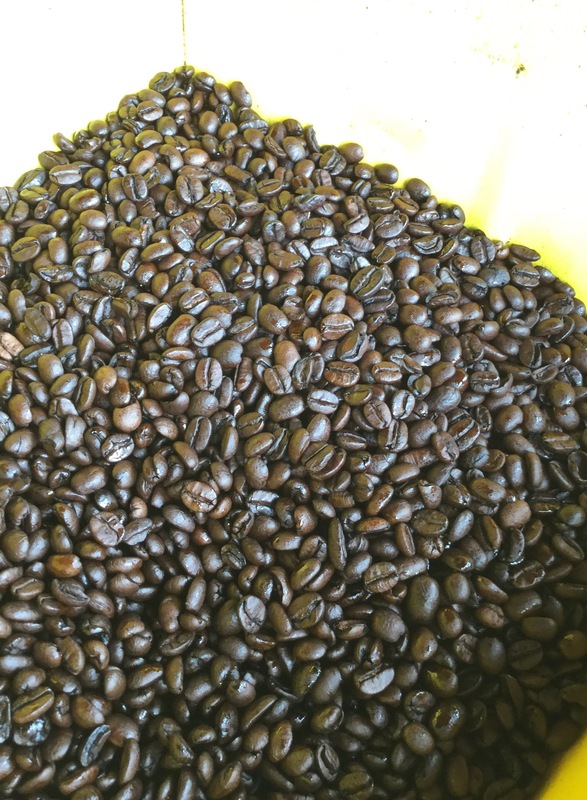 As I am there, a significant order comes in for washed green beans left from the last harvest, which due to its good cupping score, he can sell for significantly more than the cooperative currently pays for his unprocessed coffee cherries. With the farm’s forecasted yield for the 2017/18 harvest likely to be 25% greater than last season, the search for more such buyers, in the US, Asia and Europe including the UK, is now well and truly on. 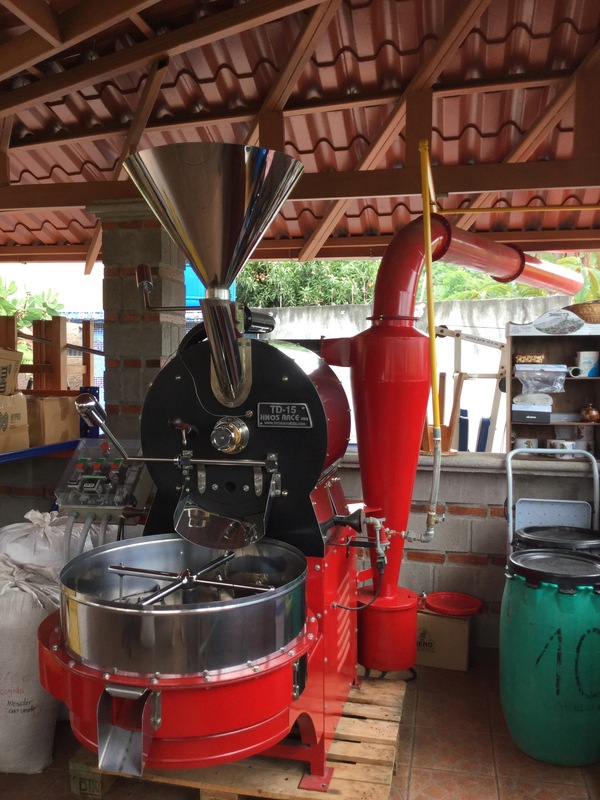 Meanwhile, in the back garden of his house in San José, where the family moved so that the children could complete secondary school and go to university, the aroma of freshly roasted coffee wafts through the air. A large shed houses a gleaming micro-roastery, a coffee milling machine, and piles of silver and gold packaging for the family’s new Café Directo brand, which they are marketing locally to shops and cafés. 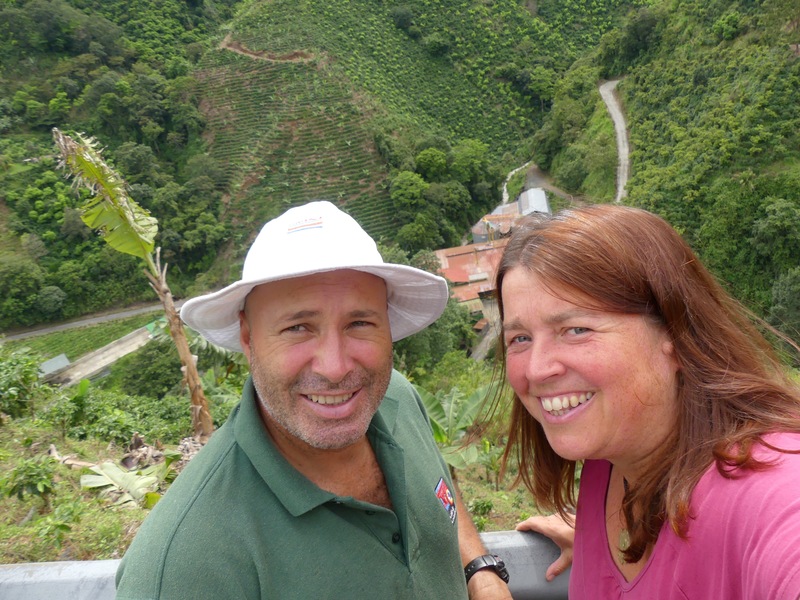 With Gerardo at the farm during the week, the rest of the family now works on roasting, milling, packaging and marketing the coffee. A whole family enterprise. The dream does not stop there. Gerardo, his wife Linnette and I take a long walk through the farm, accompanied by their hilariously mismatched little-and-large canine duo, Coffee and Chinuelo. Tiny Coffee totally believes he is equal in size to the hulking Chinuelo and keeps spoiling for a fight. We meander down the steep slopes, amidst mango, avocado and lemon trees, bananas and plantain, beans and corn, alongside thousands of coffee bushes of different varieties already heaving with green beans, climbing around to the nursery of around 25,000 new seedlings, the abundance all around seems to augur well for the future. The coffee nursery. NB No forest was cut down, this was rocky scrubland before! Further down the precipitous slopes, we arrive at a spectacular waterfall, one of the most thunderously impressive I’ve seen on my journey through South America, and the river continues to race down the valley. Gerardo is currently working with water engineering professionals to explore a hydroelectric project here – it would be a massive investment, but studies of the potential look promising so far, and could contribute to the wider area’s energy sustainability, generating way more power than the local farms need. With much more land, a significant workforce of his own, an emerging coffee brand and a possible energy project in the pipeline, I wonder if Gerardo has now outgrown Fairtrade altogether. The boy who almost didn’t finish primary education, and former illegal migrant, now appears to hold a school-of-life doctorate in social and economic development, business and enterprise. 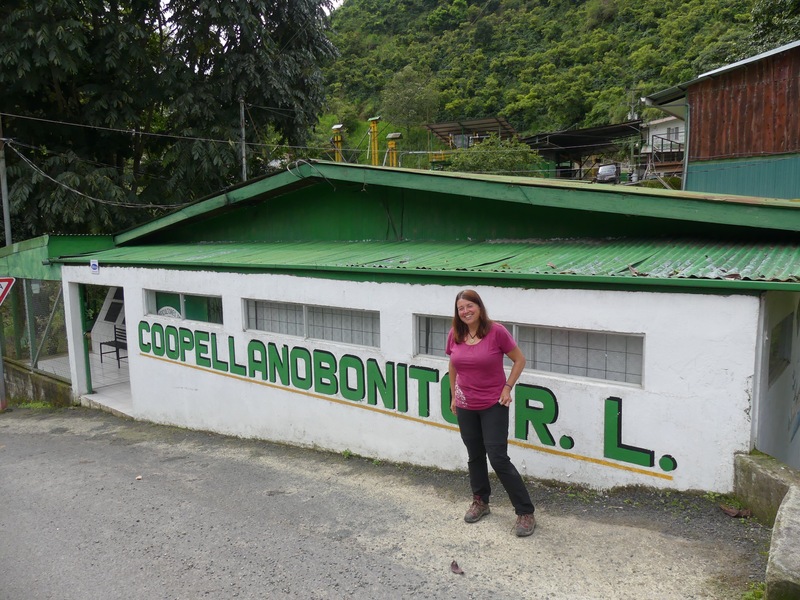 However, he is still selling a significant volume the the Fairtrade Coop, and when we visit CoopeLlanoBonito, it becomes very clear to me how much coops like this desperately need to retain the involvement of their most entrepreneurial farmer members. They need farmers who have vision and ambition, and are both willing and able to take risks, and to bring this experience into the wider coop’s communal development and future business plans. From the moment I landed in Costa Rica, I’ve been struck by how much more expensive life is here than in Colombia or Peru. Whilst in many African origins small farmers and workers might be eking out a living on less than US$2 a day, in this country the legal minimum wage is around 1200 colones, well over US$2, per HOUR. Food is more expensive, housing, clothing and fuel. All this means the cost of production for coffee is much higher here. Even the Fairtrade minimum price for coffee is barely covering their costs, the cooperative’s manager Ricardo tells me. Anything below US$160 per quintal and the coop is making a loss. It’s clear it has been going through pretty tough times in recent years. It is struggling under a burden of debt, and equally struggling to reform its buying practices with farmers who still deliver their coffee by physical volume, rather than using quality incentives. Gerardo, although no longer on the board, is still busy offering his insight, expertise and contacts in the industry, and championing the need to innovate with new quality systems, speciality programmes and an ability to market microlots. 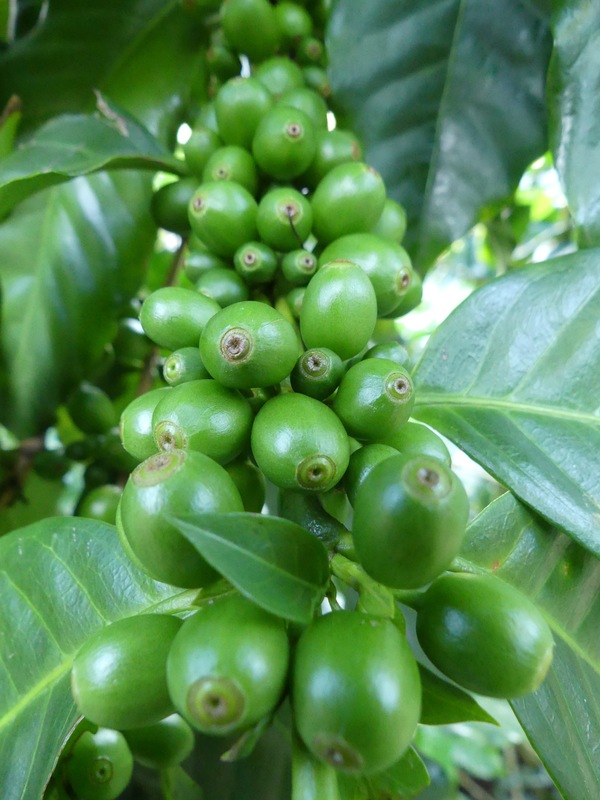 I can’t help thinking that if the coop does not evolve, then the farmers who want to innovate and go for top quality will simply look for better markets for their coffee, which is the last thing the cooperative needs. However, with the prestigious designated origin of Tarrazú, and a growing market for single origins and distinctive, quality coffees, the expertise of farmers like Gerardo could inspire the change that would turn their fortunes around again. 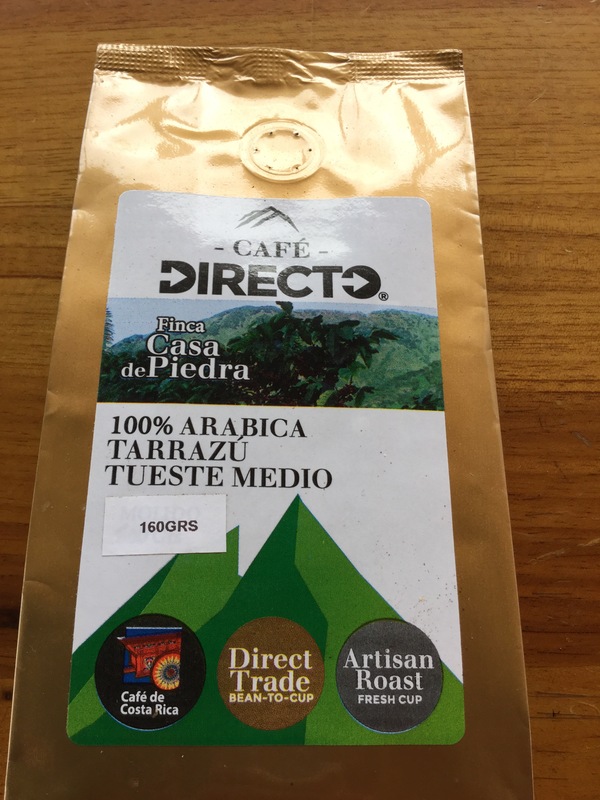 Other cooperatives in the Tarrazú area, such Coopetarrazú and Coopedota, are clearly already tapping into these markets quite successfully – as I visit tourist spots and national park areas I see their brands everywhere – from the name of the café in the bus station to ranges of single origin coffees in gift shops and wildlife lodges. There is still everything to play for, and I hope that the farmers of CoopeLlanoBonito can also capitalise on the opportunities out there. 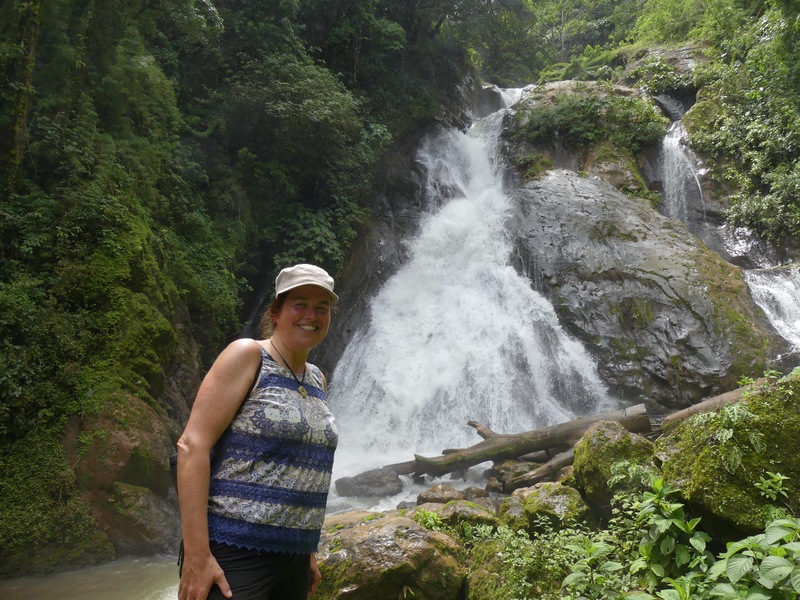 Our long walk through the farm eventually takes us downhill as far as one of the Casas de Piedra, perched just above the river, where a small freshwater spring is gurgling in the middle of the rocky overhang. There’s just one dry spot under the shelter of the rock, and it was to this place that young Gerardo and one of his brothers would decamp for up to three months during the summer harvest season. They liked it there because it was near the river so they could jump in after a hot, dirty and sweaty day working on the farm. It also meant they didn’t have to haul as much water up the steep hillsides for the house, in the days when the only water had to be collected from either a spring or the river. As we stand in the shadow cast by the overhanging, dripping stone, Gerardo tells me one of his aunts was still living in a casa de piedra on the day she got married – she literally set off to her wedding from under a rock. It seems unthinkable now, but it was only one generation ago. Casa de Piedra is no longer a makeshift home under a rock. It’s the farmspring from which an entire business enterprise, a quality direct coffee brand, a future clean energy project and a vision of a brighter and sustainable future have begun to flow. Awe inspiring! Thank you Barbs for meeting such wonderful people and telling their stories on their behalf. And welcome home dear traveller!! Gerardo is a great representative of the Costa Rica Tarrazu Coops. Lovely man, and no one knows more about coffee. We have really enjoyed meeting him. Well done Barbara – some fabulous photographs.